N.I.V. 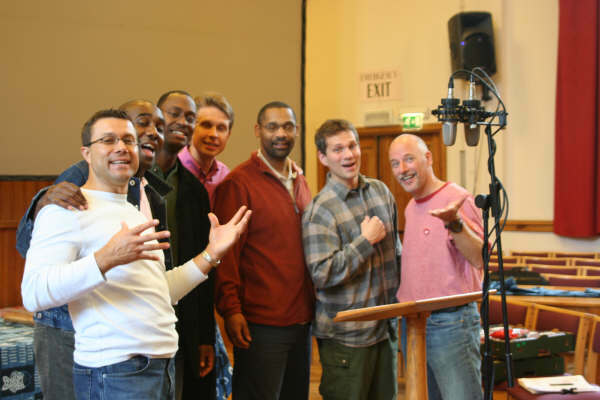 stands for Newbold International Version, and as the name indicates, the members of this male vocal Christian acapella group are of different national backgrounds and met while students at Newbold College close to Bracknell, England. I started singing with the group in -91, which is why I’m sharing some of my video-takes with you. Unfortunately, the sound and image quality of a Sony video 8 camera isn’t all that impressing anymore. The unique experience of a Christian community, Church and dormitory/married students’ quarter- life that this Seventh-day Adventist college provided, both building a solid friendship within the group and getting together for daily practices was easy. Thus the group gradually built up a repertoire of about twenty Christian accapella songs from 1989-1993. Some songs were added later while on tour. Even after several of the N.I.V. members graduated from Newbold in -93, the same group got back together from all over the world to tour both Holland in -94 and Norway in -95. After an eleven year break, they gave the Week of Spiritual Emphasis at Newbold College in October 2006! The experience of being able to share the Good News through singing and talks lead to an invitation as the main guest speakers and singers at the 2008 SDA Norwegian Summer Camp, and the following year at the SDA 1-100 Camp in Finland! Enjoy the recordings in this post. Geert – Originally from Holland, Geert has an M.A in Theology and pastoral ministry from Newbold college England worked as dean and leader of Spiritual and social activities at Newbold College and senior pastor at Central London Church. Geert is married has a daughter. Paul – currently serves his church in Manchester as an elder. He completed a theology M.A at Newbold College in 1994 and later went on to further studies in counselling, social work and mental health law in Manchester, England where he lives with his wife and their daughter. Paul is originally from Manchester but has his roots in Jamaica and Barbados. Leslie – graduated with an M.A from Newbold College, is a qualified family counselor and is the Family life leader for the Adventist church in the South England Conference (England) He comes originally from London but has (parental) roots in Carriacou, West Indies. He is married has two children. Robert – Pastor of Silkeborg and Århus Cafékirke. After completing an M.A at Newbold College Robert pastored for three years in England before coming to Denmark in 1997 as youth pastor at Vejlefjorskolen, now pastoring at The Cafe Church in Copenhagen. Robert has three children. He is originally from England and has roots in Jamaica. Rune – Teacher at Ekrehagen skole Tromsø for 14 years, Torderød skole, Moss for 6 years, Norway. After graduating from Newbold with a BA in Theology, he studied English, P.E, Maths and pedagogic in both the US and Norway. He has been involved in teaching and education the past 19 years. Married to a lady from Finland and they have 4 sons. Theodore – is pastor of Lewisville SDA church, Texas, USA where he lives with his wife and son. After his B.A from Newbold College Theo graduated with and M.Div from Andrews University Michigan USA where he later completed a PhD in Adventist Theological history. Atte – comes from Finland and graduated with MA (OT major, Missions minor) from Newbold College, currently working on his PhD with Newbold. He has served the last 7 years as the president of the Adventist church in Finland and is married. Onno – from Holland, and he sang with the group in 91/92 + joined in concert at SDA Youth congress, Holland, 1994, and has since that time not sung with the NIV. But we’re hoping he’ll be able to join us at a reunion sometime. N.I.V. held a concert at one SDA-Church in Belfast, Ireland in the spring of 1993. Only a part of the song was recorded. Performance in a concert at Newbold College in the spring of 1992 just after producing a cassette recording that sold nearly 1000 copies. N.I.V. reunion in Holland where we gave a concert at the Dutch SDA Youth Congress in 1994. Performance on a tour in southern Norway in the winter/spring of 1995. The SDA Norwegian Union Youth dep. secretary, the late Kåre Lund, arranged and sponsored the tour. We were struggling a little since one member couln’t join us on this tour. The N.I.V. contributed at a fund-rasing concert for ADRA at Hull, England, in 1992. This song the N.I.V. first performed in 92/93 and became the fastest and perhaps snappiest spiritual in our repertoire. Here in concert on cruzade in Czeck rep. This song the N.I.V. first performed in 92/93 and became the fastest and perhaps snappiest spiritual in our repertoire. Here performed at Newbold College. This song the N.I.V. first performed in 92/93 and became the fastest and perhaps snappiest spiritual in our repertoire. Here you can tell our second tenor is missing. Performance at Newbold College in concert, spring 1992. The N.I.V. joined a crucade with an evangelistic team in the Czech republic in 1992 where we visited a large number of schools singing, even miming and giving short talks. We also gave two complete concerts both at Churches and a packed concert hall. Here performing for a lively audience of Dutch youth. Among a mix of several groups and choirs, the N.I.V. felt priveleged to contribute to an ADRA fund raising project for Albania. Philip P. Bliss, 1871, both wrote the music and lyrics for this song, but here the arrangement is smoother and modernized. “On a dark, stormy, night, when the waves rolled like mountains, and not a star was to be seen, a boat, rocking and plunging, neared the Cleveland harbor. “Are you sure this is Cleveland?” asked the captain, seeing only one light from the light-house. Quite sure, sir, replied the pilot.Where are the lower lights? Gone out, sir. Can you make the harbor?We must, or perish, sir! And with a strong hand and a brave heart, the old pilot turned the wheel. But alas, in the darkness he missed the channel, and with a crash upon the rocks the boat was shivered, and many a life lost in a watery grave. Brethren, the Master will take care of the great light-house: let us keep the lower lights burning!” D. L. Moody. One of the few recordings of this song here performed at a Church concert in Helsinki on our tour in Finland in 1992. The tour this performance is taken from, included performances in Holland, Sweeden and southern Finland in 1992. This song always makes people’s faces brighten up. Here it is performed at Newbold College at an assessment at which the group received distinction. With the simple message of being close to God, put across by a snappy rhythm and good arrangement, it passes on enthusiasm and invites the listener to dig deeper into the storage of God’s love. The N.I.V. gave concerts in several SDA Churches in southern Norway in 1995. This song was a part of a concert held in the Bergen SDA Church. Unfortunately, Paul and Onno weren’t able to join us, but we managed somehow. Interestingly, the man sitting on the first row is the late Kåre Lund, who was bus driver, guide and spiritual mentor on our 1995 Norway tour. In Oct. 2006, the N.I.V. was priveleged to be invited to give the Week of Spiritual Emphasis at Newbold College. Here we’re practicing “Nearer to Thee” for the first time since our tour in Norway in 1995. N.I.V. reunion, this time at the annual SDA Summer Camp (previously called Family Camp) at Nisser, Telemark, Norway in the summer of 2008. In this mobile phone recording, we’re practicing for the Friday night concert at the camp meeting. This song is special in that it was composed by Antti Nissilä;, Rune’s brother in law and the arrangement was done by a member of an accapella group before the N.I.V. you see here. Performance from a spring concert at Newbold college. Unique to this version of the song is that Onno hadn’t sung with the group since 1992. With only one quick practice before the concert, he was able to follow through with the solo-part and his regular part in several other songs despite a three year absence. This African-American spiritual reminds us of the importance of taking time to be with God. In addition, the historical context of the song as a code for escape from slavery in 18th century America, reminds us of God’s rescue plan for all of mankind. Performed at a Youth Congress in Holland. With bright harmonies, the song reminds us of God’s active part in giving salvation for free to all that want to receive. Performed at an SDA Youth Congress in Holland in 1994. Michael Card’s The Gentle Healer is one of the later additions to the N.I.V.’s repertoire and represents a different genre from the rest of the songs. powerfully a burning desire to be in God’s Kindom. Performance from our tour in southern Norway in the winter/spring of 1995. This snappy happy-song conveys both through its lyrics and arrangement what might happen when we meet the King of Kings – Jesus! Performance at an SDA Youth Congress in Holland in 1994. Performance from touring southern Norway in the winter/spring of 1995. Only the first part of the song was taped.